Five pairs race from Greenwich, London to Singapore without taking a plane or using a smartphone. They have enough money for the equivalent airfare (£1,329, fact fans) and if they run out they have to earn more. They’ll have to hitchhike their way around the world taking in five checkpoints, and there’s a cash prize for the winners at the end (although at time of writing we don’t know what it is). We’re pondering if this is an official version of Peking Express, it certainly sounds very similar. Did Studio Lambert get the rights to it, or is this just a similar show along the same lines? Anyway, let us know what you think in the comments. Will it be awarded a Dancing Dawson? Sure I read the prize was £20k. I’m surprised to say this, but RATW is *really* good. It’s hit the right tone, the contestants aren’t annoying and it seems like a real challenge. Eliminations start next week – whoever makes it to the checkpoint last goes home. It’s not a Peking Express clone, just as it’s not an Amazing Race clone – it straddles the line between the two. They can do odd jobs to make money, but there’s no challenges and no host – just whoever makes it to Singapore first wins 20k. Off to a very good start. I really enjoyed that. The 2 blokes annoy me for some reason, come across as cocky arrogant and entitled. Love the all female teams for different reasons. The younger team think out of the box and are good at bartering prices and things for free. The older all female team go at a more gentle pace and are just enjoying the travel. They are surely the prime candidates for the first elimination. As for the show I like the aspects of juggling working, traveling and budget to progress. Presentation and editing is nice very Apprentice esque. Will certainly be back again. The kind of show I’d like to binge watch. I can’t watch this until tomorrow but the positive comments have certainly piqued interest. 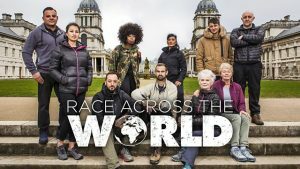 Waaay back, after I’d seen a couple of series of The Amazing Race, I remember thinking that I liked the core premise, but I was wondering if the show would work if they took out much of the railroading and gave the participants more free reign to get to each destination however they saw fit. This is pretty much what I imagined, and I really enjoyed it. I was a little nervous maybe 40 minutes in when we had a brief spell that seemed to be “Now Team 2 is in Place A, so they are travelling to Place B. And so we look at Team 3, who is in Place C, and have decided to also head to Place B”. I think, in hindsight, that was largely a recap so we knew where everyone was immediately prior to the final leg, but at the time it was a wee bit repetitive. But that’s just one short period, the beginning was great, the ending was great, and I’ll be looking forward to catching up next week. It also spurred a lot of discussion of strategic choices on this sofa. Should you take the work offers early, on the assumption that you might be able to earn a bit more from work jobs in more affluent nations than if you’re hard up in a poorer nation. How do you balance speed versus cost? If you’re stuck in a given location for a period of time, do you seek out alternative routes, work, or just rest to counter fatigue? I think the fact that it inspired a lot of discussion here was a factor in making it enjoyable. Intriguing and likeable, but I think I didn’t love it as much as the others. My initial thoughts were that £1,329 per person actually feels like quite a lot, especially in the context of how little other similar shows have given their contestants, but the teams seem to be spaffing through it at a rate of knots. (That said, the father and son won my support straight away by knowing off the bat that coach travel is the only reasonable permitted way to reach the continent, even though they got quite spendy quite quickly.) The part about teams working to make money on the way doesn’t feel like it rings true, but I’m prepared to believe I’m wrong on this one. If there were work opportunities prearranged then it feels all too safe and too much like a helping hand; if they genuinely found work themselves then it feels like it’s playing fast and loose with work permits and the like. The restriction that teams can’t use smartphones makes it a proper game, but if there’a an additional restriction that teams can’t – say – find a library or an Internet cafe and use public internet access either then that feels tough… and also arbitrary if they can find someone else and talk them into doing so. Hopefully it’ll feel more adventurous when people start travelling to less familiar locations and the language barrier becomes a bigger issue; it’ll be interesting to see just how many travel options there are or whether teams end up with less choice. At the moment the show feels a bit like it’s revelling in the privilege of the English language and also a backhanded compliment as to just how good (and, often, how cheap) plane travel really is. I’ll very probably keep watching, though, if only to gawk at the length of one of the business partner team’s necks. I wish there waere more World Wise available online than this short clip, though at least it shows David “Really Not A Kid Any More” Jensen zooming around in his cherry-picker. They explained at one point that they were given a list of pre arranged jobs at the start of the race which is where the boys got the farm job. However the job in the kitchen the girls got was not pre arranged. Everyone’s made it sound a little bit like Lost which I can dig. Yes I quite enjoyed that, had a horrible feeling they were going to go a bit Amazing Race with the editing, especially after the first five minutes, but it’s more considered with greater emphasis on the moment. This said my mind was wandering about three-quarters through although perked up again at the end. The reveal of the leg winners was a bit odd though, not sure what it added. I thought the budget tracker graphic as a percentage was a bit odd, wondered how it was going to work when people started earning money, although it works OK. Perhaps there should be a graphic with distance-to-go as a percentage as a sort of comparison, or perhaps that’d be too confusing. That said, preorganising potential work opportunities doesn’t feel quite like cricket to me. I guess you can argue that the high-ish budget and opportunities to make more money means that the contestants are suitably well resourced that they can choose to spend money on relatively quick, relatively expensive solutions and there’s more of a race in working out when the right time and place to do so is, but that does feel a bit… arbitrary. If there’s play along value of “how would you cope if you had to do it?” then dealing with the rules and constraints does feel artificial, though much less so than, say, The Amazing Race. TAR contestants sign more visas than countries they go to to throw them off where they’re actually going, so it’s not new. I am quite digging this. Although I sort of hope there isn’t going to be a weekly elimination, I get that there needs to be *some* threat to keep them moving, but it’s a show about some people going on a journey whilst going on a journey and it gets that across quite well. Although ironically with John Hannah’s “have we forgotten how to travel?” spiel at the top of each episode, other than the Blue Mosque, they’ve not seemed to have done much sightseeing. There can’t be a weekly elimination because there simply aren’t enough couples. One every two legs makes sense, gives us a three-team final. Enjoying this too, it’s been put together with a good eye for an emerging narrative and some ironic cuts, and I’m somewhat amazed at how significant a difference knowing exactly what you need to do when you arrive at a bus depot ultimately made! Duh, of course there isn’t. Well logiced. Up 300k last night to 1.8m, and that’s with Top Gear only providing a 1.5m lead-in as well. It definitely seems to have had pretty consistently positive word-of-mouth. Glancing around the usual… more curmudgeonly parts of the internet, they still seem reasonably fond of it. Oh I should add that I saw an article in Broadcast about the filming process. I’d suggest being a bit wary about it – I do think it went into spoilery territory on occasion – but it’s an interesting read for after the series is done. One non-spoilery note is that they mention that part of their brief was to make the series feel like it wasn’t on rails – insert puns here – which is something about TAR that always rankled a bit. 1.89 (10.1%) last night according to a post of Digital Spy. Growth for the 3rd week in a row. I am loving the fact that we have such varied approachs to racing and the fact the slowest route can quite often be the winning one. Had the team that narrowly caught the boat missed the boat it would have most likely resulted in a healthy lead. The girls were playing a very risky game giving up a day for free travel. Really is an enjoyable series – good old classic reality TV, although the cynic in me felt that ferry was waiting for the 4th pair regardless. Indeed would have been interesting to see one pair take the land route considering how long they were stuck at see. Hopefully gets a second series- could do something similar down to South Africa but probably a more treacherous trek. Chicago, USA to Monterrey, Mexico to Belmopan, Belize to Quito, Ecuador to La Paz, Bolivia to Asuncion, Paraguay to Sao Paulo, Brazil. Interesting to note that we learnt this week that Day 31 was November 4th. Also, I know SEA is going to be cheap for everyone, but 19-23% of your budget with 3,300 miles to go is noooooooooot good. I’ve watched eps 1 and 2 and wondering whether to stick with it. Is it worth the price of entry, or largely more of the same? If you’re not enjoying it then you probably won’t be gaining much more out of it (unless you like getting angry at millennials). If you are enjoying it, the following episodes are like the previous, but orangier. I’m digging it, but it’s scratching an old-skool reality TV itch for me. See, and I was thinking “all those contestants are going to be kicking themselves for holding so much of their budget back for the last leg; if anything, they’ve been a bit defensive with their spending” – we’ll see how it plays out. I am almost certainly guilty of underestimating the distance of the last leg due to the Mercator projection. Still very much enjoying this show; in fact, enjoying it so much that I decided to use 6% of my monthly phone data budget to stream the show live to my phone while I was on the coach. *graphic at corner of screen ticks down from 92% to 86%* This might have been slightly the weakest episode of the series in terms of making the story clear of where people were when, at a point where the gameplay might have had the most options, but it’s still a very good show. I’m only being 60% facetious when I suggest an analogy that Mantracker is to Interceptor as this is to The Amazing Race – sort of an unplugged acoustic version. The teams are all very likeable, so a big thumbs up to the casting researchers, and I have a suspicion that a lot of Dads will be getting a weird Dad-man-crush on Darron. It’s tempting to wonder whether there’s more to the ruleset than meets the eye; without going back and doing the research, I wonder if every team is required to do at least one day’s work somewhere along the way and the editing is such that every episode features a team stopping to work? (Might the teams not have the apparent degree of choice as to when they work, or might they be stopping to work more often than the show depicts?) Similarly, is it a rule that the teams must stop for extended sightseeing at least once on their journey or is the decision to sightsee genuinely arising from the racing-vs.-sightseeing prioritisation decisions that the teams make? Looking forward to the grand finale next Sunday, and I do hope that they don’t have to butcher the occasional salty language through an edit for the other side of the watershed as it’s going out at 8pm instead of 9pm. Chris – next week is the penultimate ep, although I think it’s been (wisely) moved to an 8pm slot to avoid a clash with the all-mighty Line of Duty. Second Series seems to be confirmed – applications are open. I’d expect Africa or America. It’s a bit unusual to have a clumping point that’s *so* close to the pitstop, and one that’ll effectively have clumping both ways. It strikes me that with entry/exit from their pitstop this time being effectively dictated by the ferry timings, the later two teams are going to start post-pitstop after the last ferry has gone at night. I wonder if they might arrange for charter boats back to the mainland to allow the teams to at least start racing as soon as they’re released from the stopover. Well, there’s one show from my Golden Five guaranteed. Well edited and exciting final, especially given there was actually almost three hours between the winners and runners up. Really enjoyed this. I am certainly going to give it a golden 5 nod too. There is so much they could do for series 2. A Futher distance with more teams and a couple more elimination legs. Giving the teams less money so they have to work more. Maybe a trip across America and Canada? But then again part of the appeal was seeing so many different countries and cultures. Unlike The Amazing Race I appreciated the time spent showing more of the local scenery as well as some of the travel. 3 hours is pretty bloody remarkable given the length that they travelled. What I liked about the format (if I understood it correctly) was that there was no artifice in the race – if you arrived x hours ahead, you maintained x hours of lead for the next leg. Yes, it is missing *something* but if you start adding too many features to it, it encroaches on Amazing Race and its ilk. Thoroughly enjoyed the finale, and I submit it is a convincing early leader in the clubhouse for this year’s Hall of Fame. More than anything else, it makes me wish that Channel 4’s Lost were still available for comparison, an earlier Twenty20 version as opposed to this Test match. While the element of having to work out where you are in the world is wonderful, I am more interested in watching logistics decisions than hitchhiking, and I don’t recall Lost’s couples as being as likable as the ones here. In truth both shows were very good in their own way and comparing the two is fanwank, but that’s what we’re here for, isn’t it? Best new reality show from the BBC in a very long time. Hopefully series 2 just picked up 5 minutes afte the first where the producers tell them they’re not getting a flight home!